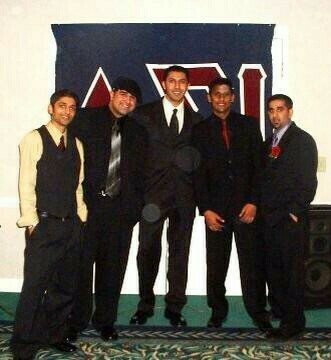 OUR FOUNDING FATHERS - DELTA SIGMA IOTA FRATERNITY, INC.
Tarak wanted for other students like himself to have the same opportunities he did. Opportunities that empowered him to forge lifelong friendships with numerous individuals and be part of an organization, whose impact to the community would be remembered long after its members graduated from college. Tarak completed his Master’s Degree in Finance from Penn State and is currently working as an investment analyst at a financial services firm in the Philadelphia area. Roby attended Penn State University and graduated in 2002 as a Finance major and Economics minor. In addition to having found the Fraternity, Roby competed on the Penn State boxing team and was a student advisor for the Smeal College of Business. Vishal was elected the first president of Delta Sigma Iota in the Fall of 2001 and then held the position again during the Spring of 2002 and 2003. His goal for the fraternity was to build great leaders, who would take the values and beliefs of the fraternity and make an impact in the lives of others. Currently, he works as a Finance Specialist in SAP for a consulting company out of the New York region and is happily married.. Since his childhood, Rupesh has always believed in three important roles of life: Family, Friends and the gift of Laughter. Rupesh and his family moved to Cherry Hill, New Jersey where he spent his adolescent life and thereafter. Here he attended Cherry Hill East High School and made some lifelong friends, one of whom he had co-founded Delta Sigma Iota with. Rupesh’s collegiate life took him from Rutgers University and onward to Penn State University. At Penn State, he earned a Bachelor’s Degree in Economics and went on to work in the banking industry as an I.T. Technician for Commerce Bancorp. 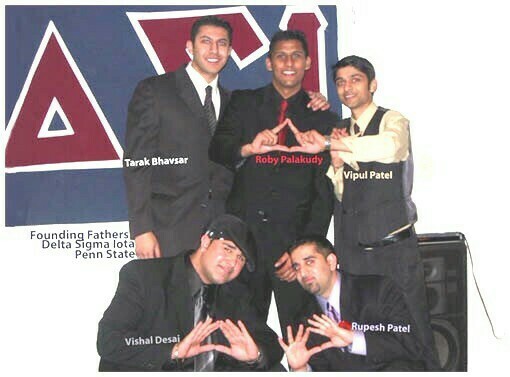 When Delta Sigma Iota was created and implemented by the Founding Fathers at Penn State, Rupesh wanted to bring two key aspects to the South Asian community through Greek Life. The first was to maintain the utmost academic integrity amongst South Asians at Penn State and the second was to give back to the South Asian Community worldwide through philanthropic activity. After graduating high school, Vipul attended his dream school, Penn State University. Vipul graduated in May of 2003 with a Bachelors degree in Operations and Information Systems Management at which point he began working at Merck-Medco. Seeking a better opportunity for advancement, he left Merck-Medco after 2 years and took on a position with Deloitte & Touche LLP working in the field of IT Risk and Assurance. With a solid job and family, Vipul hopes he can better assist any future Delta Sigma Iota brothers that may need a little support when times are tough. Networking is a strong belief of his as well as part of the foundation of the fraternity. He feels that being part of a fraternity extends far beyond the short period of a student’s college life. In actuality, it stays with them forever, and in order to keep that everlasting brotherhood, one must make an effort to keep the chain connected.